As a payroll professional, you can’t afford to make mistakes. Are you fully versed in the rules, record-keeping policies, withholding regulations and labour standards affecting payroll processing? Are you up-to-date on the government’s latest changes, amendments and requirements? 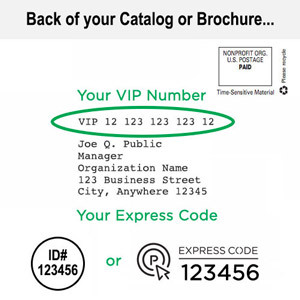 Even seasoned payroll pros may find themselves needing a refresher and if you are just getting started in the field, navigating the finer points of payroll law can easily become an exercise in frustration. 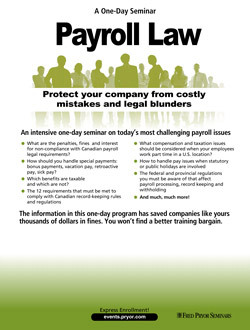 Attend this information-packed seminar and gain a thorough understanding of Canadian Payroll Law, including employment and labour standards that affect payroll processing, withholdings, garnishments and deductions, the role of Federal and Provincial government regulations, special concerns involving the U.S. and much more. What are the penalties, fines and interest for non-compliance with Canadian payroll legal requirements? How should you handle special payments: bonus payments, vacation pay, retroactive pay, sick pay? What compensation and taxation issues should be considered when your employees work part time in a U.S. location? This section introduces you to the fundamentals of Canadian Payroll procedures and includes everything you need to know to comply with government regulations regarding payroll. There’s a lot of meat to the Fair Labour Standards Act, and regulators are watching closely. It takes careful maneuvering to stay out of legal hot water. The most innocent mistake can result in a substantial fine and with you losing credibility with your company. Be prepared by knowing what’s expected, what’s changed and where there are loopholes. Exempt vs. nonexempt employees — are you applying the FLSA properly to each? What are your company’s responsibilities for travel time, on-call time and time employees spend waiting on behalf of your company? Are all meetings and training deductible — even those that are primarily vacations? Most recent updates to Provincial-specific Employment Standards and Labour laws and how they affect payroll processing (e.g. new protected leave laws, Alberta Bill 17, etc). Don’t let withholding issues trip you up. Learn exactly what your responsibilities are when it comes to withholding tax, discover situations where withholding tax is not required and learn the distinctions between Federal and Provincial Regulations. These situations don’t come up every day … but when they do, payroll professionals must know how to properly handle them. What compensation and taxation issues should be considered when your employees work part-time in a U.S. location? How to handle extraordinary payments: commission payments, director’s fees, etc.